I looked at the stats on Social Virtual Reality, or Social VR as it is commonly know, and saw that there were 1600 searches for that term on Google last month, which is tiny. Especially compared to looking up the names of ‘VR headsets’, or ‘Virtual Reality’ itself, coming in at millions of searches combined. Yet, this is not the small corner the VR that you may expect from those facts – there are specific VR apps that have already taken off and have millions of users. People simply don’t Google much for the term, but go straight for the apps. David Amerland – author, speaker. As many of you reading this will know, myself and Elisa were married in VR last year – using a Social VR platform called AltspaceVR. We had a lot of fun, were featured in a lovely BBC documentary about Cardiff Bay, where I was living, and deep down you probably expected we would then be plugged into the computer 10 hours a day – but that didn’t happen. It was only when I became involved in a pilot project with the National Health Service (NHS) in the UK to help patients connect with a) each other, and b) clinical psychologists, that we dusted off the headsets and began to connect in virtual spaces once more. The use case we were waiting for had arrived. The fact is, as the survey in this paper will show, there is good interest in VR for many applications, but it still feels ‘too soon’ for mainstream adoption. But with a pilot project focused on the applications for patients, we see that Social VR could well get a good boost over the coming months/years – the application simply makes sense. When you add in the idea for ‘a virtual stage’ for anyone with a voice and desire to be heard, we can see the potential of Social VR as a next wave for human communication, albeit often as a humanoid or robot avatar. With Virtual Reality there will be two types of people: consumers and producers. In about five years time, I would predict the former will be more than 99.9% of people enjoying the ride, and the remaining people will find their voice and build a community around their niche content (think about how ‘comedians’ use social media now), or helping other people (like patients) connect with each other. The real thing here, no matter what you are looking to express, is to transcend any VR app that may be used as a tool – instead you want to hone your art, and be ready to perform in a new space. This view has come from over two years of exploration. And I see Social VR as the perfect place to deliver content that can ‘live forever’ – think like video, but in VR, and it can be done ‘now’. The VR experience is recorded and can be ‘replayed’ as if it is live when watched. 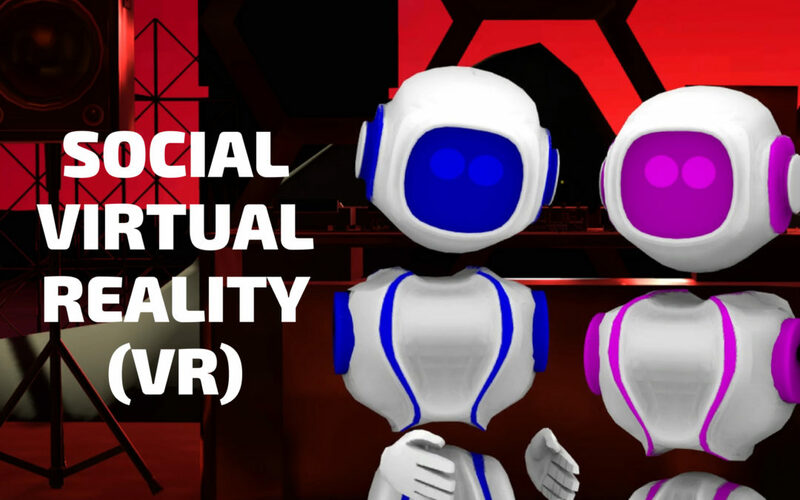 This technology was experience by a handful of people through AltspaceVR3 and gave us a glimpse of a potential future but the ‘recording in VR’ is not publicly available yet (and is not to be confused with 2D video recording, which you can do). Recording in 3D, allows for a ‘time travelling experience’ where you can even re-visit one of your own events and attend in the future. There was a scene in the TV show ‘Fringe’4 which gives you some idea of how this looks and feels, without trying it in VR for yourself. May 2017 when myself and Elisa got married in VR, in most part for the fun of it but also as it’s proven to be a case study of how to run a global event using this technology. You have to write the script (which is the best way to approach it) with ‘now’ and ‘then’ both in mind at the same time i.e. for the live version and the future attendees who won’t know any difference to, what will be then, past attendees. It is said that interactable objects can be passed across timelines.5 If you want to bend your mind then that certainly will. All in all, this means you can deliver content once, and people experience whenever they happen to arrive. In the future we can tell our stories, and have virtual visitors from the future watch them as long as the power is still on. You navigate around the scene, not as a passive observer from a fixed perspective (as is the case on 360 video now), but free to roam. Think about this for a second: you can deliver a live event once, and give people the link so they can attend as if it was live, but in the future. VR recordings as a concept is a leap in marketers’ ability to efficiently build brand, community and (if they know how) to create conversions to e.g. opt ins. The same applied for presenters, and educators too. I’ve tested all of this. It works. I’ve heard from the community manager at AltspaceVR (the app I used to put on VR comedy shows) we had almost 1700 people register for the last ‘Meta-Geekonomics’ event (a comedy game show, using hundreds of video samples). In another event I achieved a 50%+ conversion rate from a call to action to give email. When you can let the event run once a day, or on demand, you have a content marketer’s’ dream – effective use of new technology to drive a quantifiable marketing results. The key is this though: content, within a VR context. Good, relatable content that drives people’s emotional responses within this new world. My content has taken me 500 hours+ to create – with themes of VR and Artificial Intelligence running through it. All in all, I like the idea of us being artists with a sense of humour. And now my next show have a mission ‘To make Ai chuckle the moment it wakes up and becomes self-aware’, which myself and Elisa find amusing at least. As it stands, right now you can get attention around ‘unique VR’ experiences – and also build your brand in the mainstream as a ‘breakthrough’ persona. And I expect the opportunity for medical applications, for instance, will get you national press coverage. How Ai and VR will work together is down to imagination, until it happens. But one of the most obvious applications will be connecting social data (from existing sources) and feeding back into changes of the content that is delivered. If you think social media is personalized now, simply add in social data (preferences, connections) plus real time eye tracking (and later ‘telepathy’ will enter the equation6) and you are on the way to unique worlds of experience being created. d) a reason to be using Social VR – this has to be the most important. Find a reason, create content, and bring people together. This technology is gradually being adopted, but as Internet pioneer Tim O’Reilly said, “Being too early is indistinguishable as being wrong”. Be sure to invest in your content, your approach, your style. Content combined with community is what you will drive forward, irrespective of the tech. 5Introducing VR capture https://www.youtube.com/watch?v=Z27kI9a877U – this shows passing objects to a future self. When I moved back to Cardiff I teamed up with Dr. Greg Thomas to answer some questions I had relating to research into ‘Presence’, seeing as in the VR world it was, well, ever-present. I was particularly interested within the context of Social VR applications, including to what extent having higher quality headsets, including ‘hands’ and better audio/visual quality, would make to the experience. This literature review has been compiled to evaluate and describe the factors that lead to a greater sense of presence within Virtual Reality (VR) environments. Although there is some debate on how presence is defined, and how it is separate from the Immersion within a simulated space, there is a large level of agreement that Presence is a psychological state that is aided by greater Immersion in a space through technical advancements. This review describes how Immersion may be facilitated through visual and audio input, and how embodiment and hand movements are important, but also the strong need for psychological engagement to create presence in VR. Can be described as the “sense of being in the virtual environment”, and is a cognitive state that stems from various senses processing stimuli information in the environment (Slater and Wilbur, 1997). A ‘‘perceptual illusion of non-mediation’’ produced by means of the disappearance of the medium (i.e. VR headset) from the conscious attention of the subject. Sometimes known as the “place illusion”,” immersion”, or “media presence”, it is the general sensation of being in a real place, and strongly linked to sensorimotor input, and regulated by the level of immersion of the VR system (i.e., ability to deliver sight, sounds, and movement in a VR space). a. In other words, perceiving the VR environment to be a real place you are located in. 2. An “inner presence” linked to broad psychological phenomenon and not necessarily linked to experience of a medium (VR set). Linked to emotional states, where narratives can engage people with a VR space and increase presence, and identifying with characters/avatars makes the experience seem more real. a. In other words, an emotional connection to the context of the VR space you are in. There is often quite a lot of confusion between the terms “immersion” and “presence”, and sometimes these are used interchangeably, even by experts in the field (Bowman & McMahan, 2007). This can be confusing, so this review adopts the view of Slater and Wilbur (1997), as taken by many other researchers (e.g., Cummings & Bailenson, 2016; Diemer et al., 2015), where “Immersion” is the quality of the technology to create an environment, which may then lead to a greater sense of “Presence”. The importance of presence in VR is not just enjoyment, but it can also have demonstrable benefits. In a systematic review of 11 studies, Maloy and Milling (2010) found that VR systems led to significant reductions in perceived pain, both among people having pain experimentally induced, and for patients undergoing care for burn injuries. These benefits were often found to be above those of simple distraction methods, and the authors note the potential for greater presence through VR to remove one’s self from the painful experience they are currently enduring. The three factors of presence; spatial, engagement and ecological validity have received support in other areas of VR research, and appear to be well-grounded in the literature (Schubert, Friedman & Regenbrecht, 2001). There are numerous factors that influence the level of immersion in a VR space to create the sense that a perceived simulation is “real”. There is no exhaustive list of visual elements that are important to a technical simulation of immersion, which includes feature of both hardware and software Bowman and McMahan (2007), such as qualities of the visual display, range of display, refresh and frame rates, lighting, textures, tracking of movements, and so on. The technological factors listed above have a great deal to play in creating an Immersive environment in VR, but the connection between Immersion and Presence is not a perfect alignment. Technological advancements generally create stronger Immersion (Diemer et al., 2015). But in a comprehensive analysis, Cummings and Bailenson (2016) argue that although someone may wish to create the most technologically-advanced VR headset and technology to create an incredibly high level of presence, there has to be some limits, and so they evaluated which elements are the most important to creating immersion. In a meta-analysis, they combined the results of 115 research studies (total sample size n of 6,998) into a single statistical model. Overall, results show that increasing elements on immersion through technology had a “medium” sized correlation2 with perceived presence (r = .32), suggesting that technology is useful for Immersion, but it is not the only factor involved with creating presence (Diemer et al., 2015). Tracking Level: Number and types of degrees of freedom that a user’s physical movements are mapped, such as using cameras to detect body movements, or using a joystick. High vs. Low: composite of more complex studies comparing multiple aspects. For example, a study comparing head-mounted display with body tracking over a PC screen with no tracking. Results indicate that immersion can be increased by greater use of technology, but there is no guarantee of greater technology creating stronger sense of presence. The most important indicators of immersion are through greater use of tracking for body movements, the use of stereoscopic vision, and having a wide field of view. Interestingly, greater image quality was not strongly linked to immersion, but instead the authors argue that the ability to position oneself within a space (using visual and bodily space) are more important than the image quality of that space. An additional study not included in the Cummings and Bailenson (2016) review demonstrates the importance of technological advancements for immersion. Hoffman et al. (2006) compared 77 participants in three conditions; a control group with no VR, a group where high-quality VR was used (head tracking, sound effects, high-resolution and high field of vision) and a group using low-quality VR (low resolution, lower field of vision, and no audio). 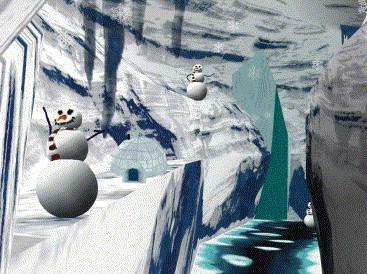 The test was to apply a heat presser, which caused a (safe) amount of pain, and then to see how pain people felt within in a VR simulation of “SnowWorld”: a frozen land with snowmen and penguins throwing snowballs (see Figure 1). Use of VR, either low or high-tech was associated with significant reductions in time thinking about the pain and pain unpleasantness, but the high-tech VR was associated with significantly greater reductions in pain perception than the low-tech VR. Interestingly, there was no difference in score of perceived presence between low and hi-tech VR. This suggests that not only that better VR technology is a powerful way to encourage presence (to the point of reducing perceived pain), but that measures of presence may not capture the full extent a person is “present” in VR. Bergstrom et al. found that the most important predictor of presence were the presence of environmental sounds, and the non-auditory factor of Gaze. Although the use of auralisation and spatialisation were useful at enhancing presence, they were less important that the other two factors. Even in a simulation focused upon the sound of the quartet, it is notable that the two factors not directly related to the sound of the quartet were the strongest predictors of presence. Additionally, participants randomly had their right hand visualised in VR space (using basic hand movements, and not fingers), or did not have their hand visualised. Participants were then told to move their hand forward, and try to touch the jar in front of them. Results showed that among people without arachnophobia reported no fear recorded. Among people with arachnophobia, perception of the VR spider (but told of a real snake) had lower fear than those who saw a VR snake but were told of a real spider. Combined with the VR hand, fear was higher among those who could see the VR spider and had a VR hand than those who couldn’t see a hand, but no difference in fear was found between those informed of a real spider with/without a VR hand. For VR presence, mean scores are shown in Figure 2. 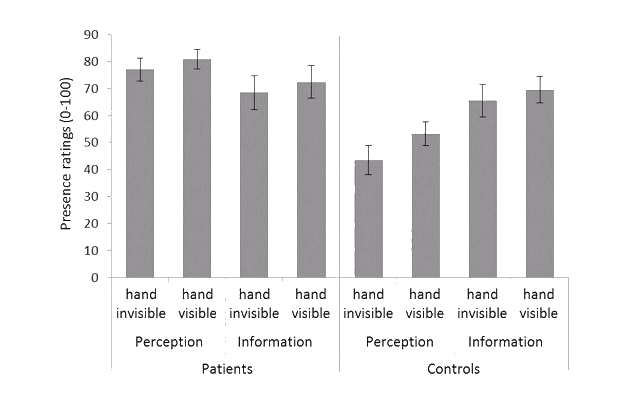 Figure 2: Mean level of Presence between Perception of a VR Spider or Informed of a real spider (but perception of a snake) between arachnophobia patients and controls (Peperkorn et al. 2016). Peperkorn et al. (2016) argue that a VR hand increased Presence among participants, but also that emotional feedback (knowing a real dangerous animal was in front of them) increased presence, in line with Engagement with Presence ideas (see section 5 of this review). Alternatively, some have explored how different types of hand avatars may influence perceptions. In their experiment, Argelaguet et al. (2017) compared perceptions of agency (feeling in control of a hand), and ownership (feeling that the VR hand represents their own). Participants took part in three conditions where hands were displayed (using Leap Motion technology) in different levels of realism: a simple ball object (abstract), a virtual outline of hand details (iconic), or a life-like avatar (realistic). Two tasks were presented: to move a block over a virtual fire, and then to place their hand avatar near (but not touching) a virtual spinning saw blade, as shown in Figure 2. Argelaguet et al. (2017) found that the sense of agency was higher among the less realistic avatars (ball or iconic hand) than the realistic hand, suggesting that the realistic hand wasn’t as responsive and that they didn’t have sufficient control of the hand. However, the sense of ownership was higher for the realistic hand avatar, where the hand was perceived to be their own. The authors suggest that although agency is important, the realism of an avatar is a separate factor in embodied presence. They compared the four groups for perception of presence using the ITC-SOPI questionnaire, as well as participant’s heart rate before and after the task. Results showed that the narrative led to greater sense of presence (for both VR or for PC monitor use), and that high immersion was linked to greater sense of presence (for both narrative and non-narrative conditions). Importantly, they also found a significant interaction effect, where the combination of high-immersion and narrative led to the strongest sense of presence. The authors argue that Immersion (VR) increases the place illusion, while the narrative contributes to generating an emotional response and strengthening the subjects’ sense of inner presence. In a review on presence in VR, Diemer et al. (2015) highlight a number of studies that find that the strength of an emotional experience is predictive of greater sense of presence in VR, notably from work on exposing people to feared stimuli, such as spiders or heights. But there is some debate whether certain emotions are linked to stronger Presence (Dimer et al., 2015). The argument is that only emotions that create arousal, that is, a heightened state of affective experience (e.g., anger, fear, joy) are linked to Presence, whereas low-arousal states (e.g., relaxation, depression, boredom) do not (Freeman et al., 2005). Felnhofer et al. 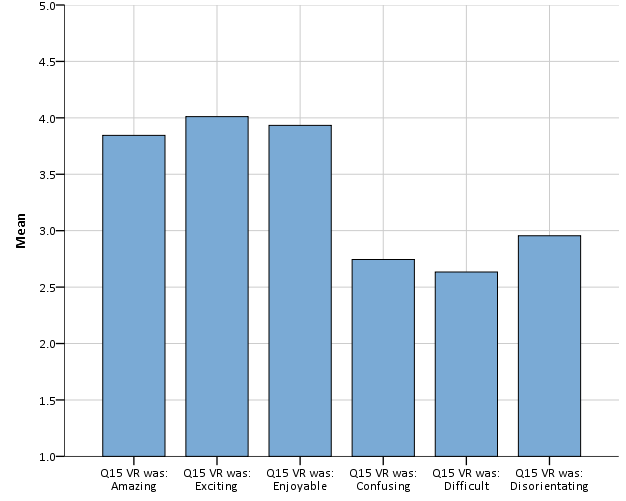 (2015) found that participants reported the experience of each emotional states that was intended by the design of the five scenarios. Despite the variation in emotional state, they did not find any variation in the level of Presence that people reported across simulations, suggesting that the type of emotional response (high or low arousal) was not significantly related to Presence. They argue instead that the mere existence of some emotional connection is more important. VR is a new territory, and the applications for engaging the mind of audience members, and patients, has only just begun. The real question is, what can you be trially yourself that will allow you to push the boundaries further? Alshaer, A., Regenbracht, H., and O’Hare, D. (2017) Immersion factors affecting perception and behaviour in a virtual reality power wheelchair simulator. Applied Ergonomics, 58 1-12. Bowman, D. A., and McMahan, R. P. (2007) Virtual Reality: How Much Immersion Is Enough?. Computer, 40 (7) 36-43. Coleho, C., Tichon, J., Hine, T. J., Wallis, G., and Riva. G. (2006) Media presence and inner presence: the sense of presence in Virtual Reality Technologies. In “From communication to presence: cognition, emotions and culture towards the ultimate communicative experience” Eds: Riva, G., Anguerea, M.T, Wiederhold, B. K., and Mantovani, F.
Cummings, J. J., and Bailenson, J. N. (2016) How immersive is enough? A meta-analysis of the effect of immersive technology on user presence. Media Psychology, 19 (2) 272-309. Freeman, J., Lessiter, J., Pugh, K., Keogh, E. (2005) When presence and emotion are related, and when they are not. Proceedings of the 8th annual international workshop on presence (PRESENCE 2005), International Society for Presence Research (2005), pp. 213–219. Gorini, A., Capideville, C. S., De Leo, G., Mantovani, F., Riva, G. (2011) The Role of Immersion and Narrative in Mediated presence: The Virtual Hospital Experience. Cyberpsychology, Behavior, and Social Networking, 14 (3) 99-105. Lessiter, J., Freeman, J., Keogh, E., and Davidoff, J. (2001) A Cross-Media Presence Questionnaire: the ITC-Sense of Presence Inventory. Presence, 10 (3) 282-297. Maloy, K. M., and Milling, L. S. (2010) The effectiveness of virtual reality distraction for pain reduction: A systematic review. Clinical Psychology Review, 30 (8), 1011-1018. Schubert, T., Friedman, F., Regenbrecht, H. (2001) The experience of presence: Factor analytic insights. Presence 10 (3) 266-281. 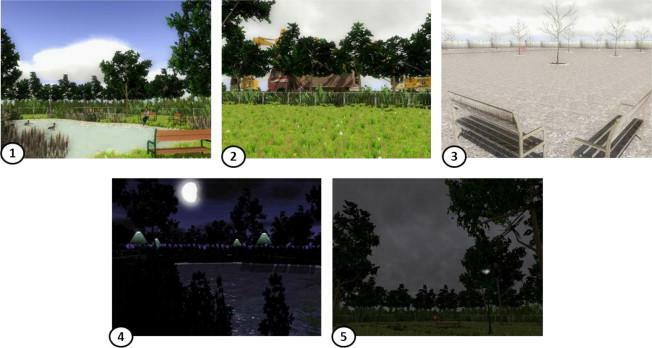 Slater, M., and Wilbur, S. (1997) A Framework for Immersive Virtual Environments (FIVE): Speculations on the Role of Presence in Virtual Environments. Presence: Teleoperators and Virtual Environments, 6 (6) 603-616. 2Correlation, or Pearson’s Product Moment Correlation, is a scale from -1 to +1, where extremes of 1 mean a perfect relationship (negative or positive), and 0 indicates absolutely no relationship. Guidelines typically suggest that values of .1 are “small”, .3 are “medium”, and .5 and above are “large”. In early 2017 I reached out to many connections via Social Media to ascertain the extent to which Virtual Reality had been adopted/experienced. Putting it simply, there was interest in this area but people’s experience was still limited – and certainly very few would have high end computers/headsets in their homes. Now we are in 2018, and new stand-alone headsets are making their way onto the market at a lower power point than needing high end mobiles (mainly Samsung) we may well see a shift; yet it is really only when ‘hands’ can be seen in VR that I would suggest that a more ‘real’ social experience will be felt. This will happen in due course too. This survey was conducted by Dr. Greg Thomas, based on that data. As of the 3rd of Feb 2017, the VR survey had collected 259 responses. However, when sorting the data for analysis it became evident there were 24 identical survey responses from a 38 year old male from Australia between 8:46pm and 9:10pm on the 30th of January. Given the short amount of time between entries, this is likely due to a computer error. To resolve, 23 of these responses were deleted, and one duplicate preserved for analysis. This left 237 valid responses for analysis. 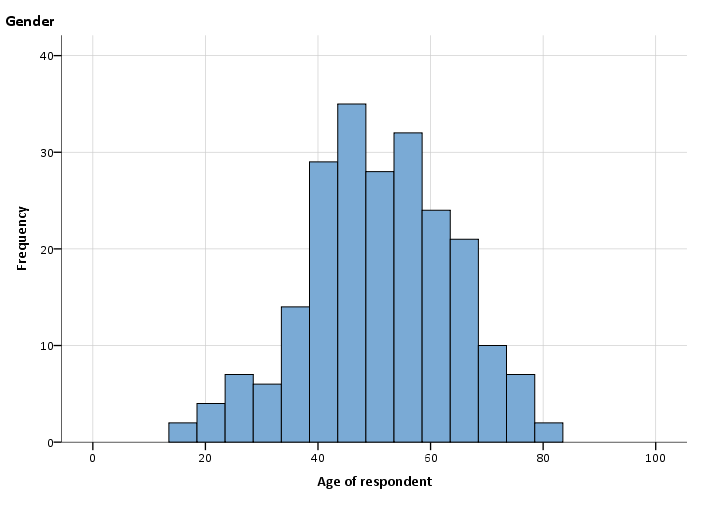 For the variable of Age, some respondents gave their age only as a summary (e.g., “45+”), so to preserve data, these entries were re-entered as one year above their minimum (46 in the example). One person gave their age as “almost 9 in dog years”, and assuming conventional wisdom of 7 dog years to 1 human year, this age was entered as 62 (7 x 9 = 63). For country of residence, all references to England, Wales or Scotland were recoded as UK, to match other mentions of UK as country of residence. 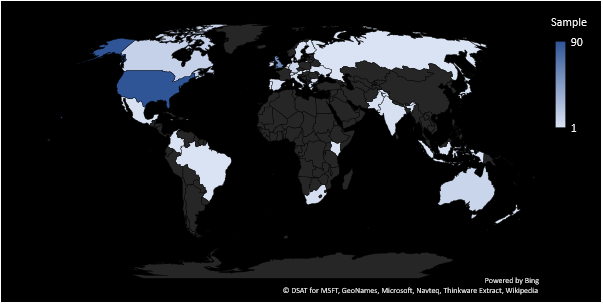 Likewise, mentions of “US”, U.S.A”, “States” or similar terms were recoded as “USA”, and one entry of “Europe” was marked as missing data. Responses were collected from 35 countries across the globe, as shown in Figure 1. Figure 1: Responses to the survey from 35 countries across the world, graduated by number of responses. The most popular countries for responses were the USA (39%), followed by the UK (25%), Canada (5%) and Australia (4%). The 221 valid ages of respondents (16 missing) are displayed in the histogram in Figure 2. Ages showed a good degree of variability, with a mean age of 51, standard deviation of 12.98, and ranging from 16 to 82 years old. The gender of respondents was two thirds male to one third female, as shown in Table 1. 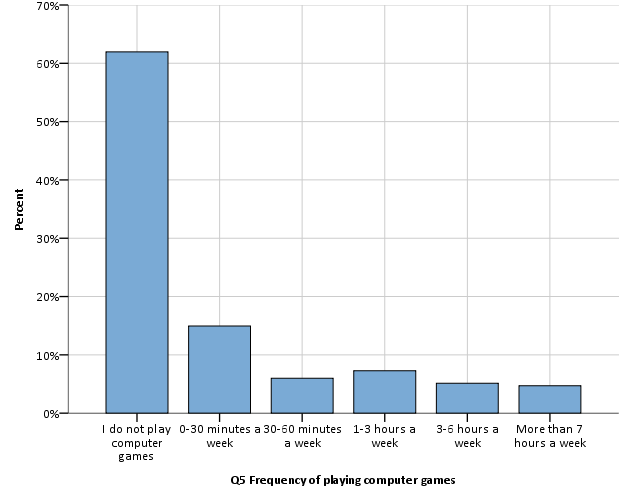 Respondents were asked to indicate the approximate frequency of playing computer games each week, with 234 valid responses received, and summarised in Figure 3. Figure 3: Proportion of sampling indicating frequency of playing computer games each week. Overall, 61% reported not playing computer games at all, 21% report playing less than 1 hour a week, and 17% play more than 1 hour of computer games. The most popular platforms for playing games were gaming PC/Laptops (23%), Nintendo Wii (16%), Sony PlayStation 3 (9%) or Sony PlayStation 4/Xbox 360 (8%). 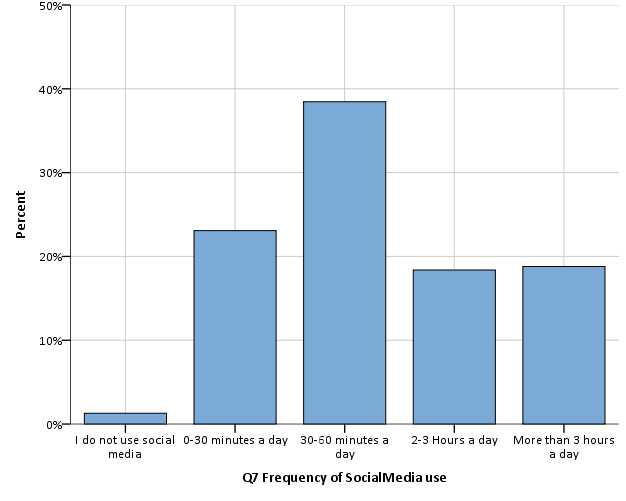 Respondents were asked how much time they spent each day, if at all, using social media. In total, 234 valid responses were returned, with answers illustrated in Figure 4. Social media was widely used, with only 1% indicating that they did not use any form, while the majority used social media between 30-60 minutes per day (38%), and 19% reported using social media more than 3 hours a day. The most popular platforms for social media were Facebook (83%), Google+ (77%), YouTube (76%), Twitter (75%) and LinkedIn (69%). Less popular platforms were Reddit (12%), Flickr (11%), and MySpace (1%). 3. What predicts interest in VR? 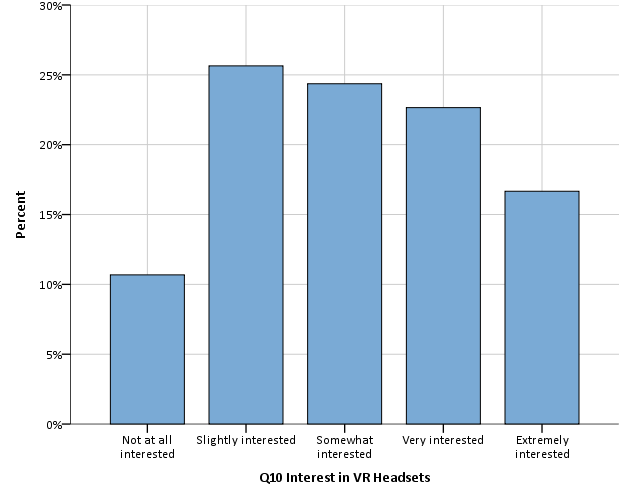 Respondents were asked to indicate their level of interest in VR headset technology on a five-point scale, ranging from “Not at all interested” to “Extremely interested”, with frequency of responses shown in Figure 5. Around 1 in 10 respondents (11%) indicated that they were not at all interested in VR headsets, while the majority showed at least some interest. Almost half the sample were “slightly” or “somewhat” interested (49%), and 39% of the sample were “very” or “extremely” interested. Descriptions of demographics for those falling into the five levels of VR interest are shown below. Demographic details of people separated by their level of interest in VR gives a broad overview of who is typically more interested in VR. For a more detailed and rigorous investigation, a stepwise multiple linear regression model was run to predict increasing level of interest in VR. Linear regression models are used to predict an ordinal outcome, such as level of support, and multiple regression is term that indicates that more than one predictor has been included to predict the outcome. When building a regression model, a stepwise approach instructs the computer to first select the strongest predictor out of all possible predictor variables, and then gradually builds the model by increasing the number of variables that can help predict the outcome (i.e., interest in VR). The stepwise approach only selects variables that offer statistically significant contributions to increasing prediction, which means that not all variables entered may be identified as statistically significant. Running the analysis indicated an excellent fit of the data (R2 = .66), and results of the stepwise regression are summarised in Table 2 below. Table 2: Summary of Stepwise Linear Multiple Regression model predicting Q10 Interest in VR technology. Coefficients shown of final model summary. The model indicated that the strongest prediction of interest in VR technology was the level of interest in using VR for watching Film/TV. This was followed by interest in using VR for gaming, likelihood of purchasing a VR system in the next 6 months, using VR for work, and knowledge of headsets. Although it may seem tautological that interest in using VR predicts general interest in VR, the key finding is that specific uses of VR vary. The use of VR to watch Film is a better predictor of interest than using VR for work. Also notable is the variables that are not included. Interest in VR for communicating with friends was not a significant predictor, suggesting that this application may not have as much interest to a wider audience. Also, basic demographics of Gender, Age, and Social Media/Gaming habits are not significant predictors, suggesting that interest in VR is not wholly occupied by young males who play games, but rather that VR is of interest to wider audiences. 4. What types of groups are interested in VR? Applying the two-step algorithm identified four clusters, or groups of people, based upon their knowledge and interest in VR headsets. Applying a name to identify the groups is a qualitative choice, and using the scores of each group on the key variables summarised in Table 3, the four groups are known as “Refusers”, “Workers”, “Players”, and “Enthusiasts”. Table 3: Summary of two-step cluster analysis results for interest in VR. Four identified clusters are described, with mean score per cluster on each predictor variable, which can range from 1 (lowest) to 5. Mean scores on each item for the identified clusters can best be shown on a plot to highlight the differences between groups, as seen in Figure 7. 5. How were people’s experiences with VR? Respondents were asked if they ever had experience with a VR headset, and of 233 valid entries, VR headset, and of 233 valid entries, 92 (40%) had experience with VR. Among these 92, the frequency of use with various VR options is highlighted in Table 4. 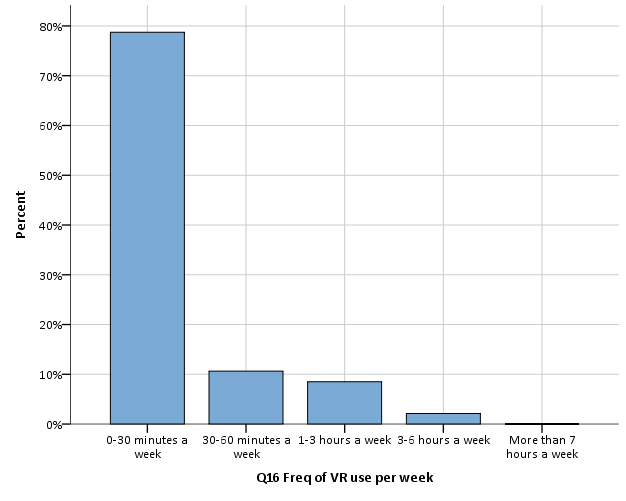 Respondents were asked to indicate, on an average week, how much time they spent using VR, with frequency of responses plotted in Figure 8. The survey also asked people to indicate how they found their experience with using VR on six variables covering both positive and negative affective responses. Among those with experience with VR, the mean agreement that their VR experience matched the six experiential responses is plotted in Figure 9. Using the 6 experiential measures, factor analysis indicated they formed two distinct measures of experience with VR, with strong correlations between the positive items (Amazing, Exciting, and Enjoyable), and strong correlations between the negative items (Confusing, Difficult, and Disorientating). These items were then combined into two separate scales, indicating positive and negative experience with VR. Among those with experience using VR, the correlation between the two is plotted in Figure 10. 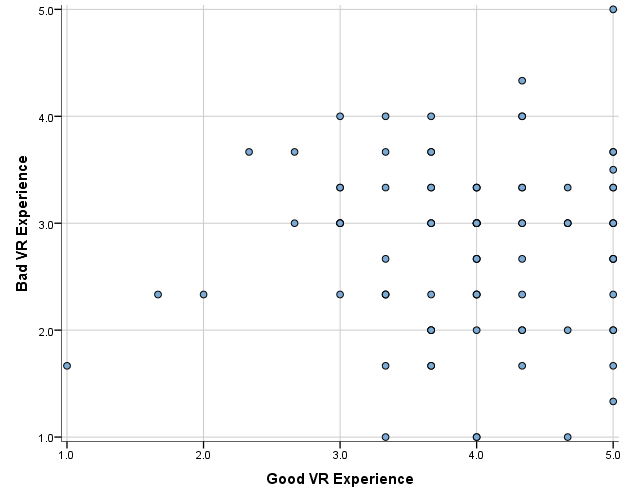 Figure 10: Scatterplot of scale of “Good” VR experience (x-axis) and “Bad” VR experience (y-axis), with greater values indicating stronger Good/Bad experience. Despite being polar opposites, it is striking to see that there is very little relationship between good and bad responses, and there was no significant statistical relationship found between the two measures (Pearson r = .04, p = .713). This suggest that those who indicated their VR experience was “bad” (i.e., confusing, difficult and disorientating) were not more likely to indicate a “good” experience. With a generally positive experience described by most respondents, it appears that even with negative experiential issues, VR technology can give overall positive experiences.